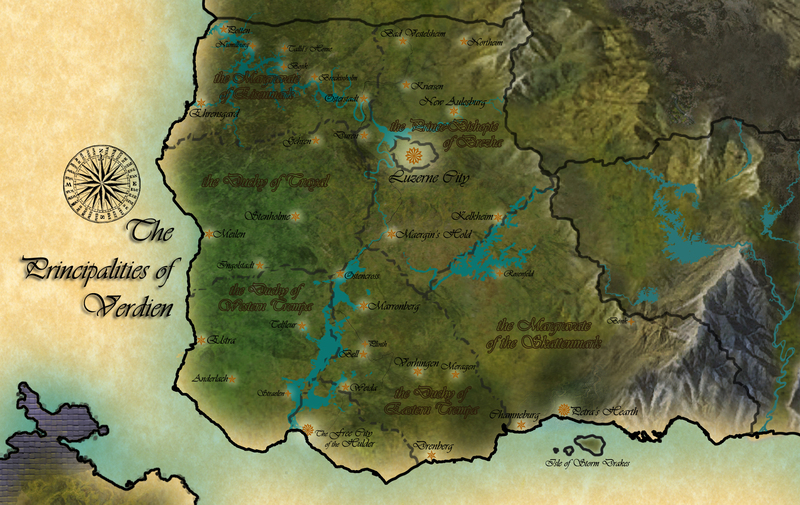 The Principalities of Verdien are divided into eight political units. In order of precedence, these are Luzerne City, the Prince-Bishopric of Brezha, the Duchy of Trayal, the Duchy of Eastern Trempa, the Free City of the Hulder, the Duchy of Western Trempa, the Margravate of Eisenmark, and the Margravate of the Skattenmark. Eastern Trempa is the breadbasket of the Principalities. It is ruled by a Duke-Regent until the Emperor confirms a new ducal succession or changes the form of its governance. The Patriarch of the Redwood Throne is pushing him to make it a Prince-Bishopric. Western Trempa has a thriving community of ritualists and alchemists, as well as theoreticians of magical subjects, thanks in large part to its distance from Luzerne City. Ritualists here are more open than elsewhere, but still maintain a certain amount of low-profile so as to avoid the wrong kind of attention. Trayal has lands well-suited to sheepherding, and good access to mineral veins in the mountains. It is ruled by a High Steward until the Emperor confirms a new ducal succession or changes the form of its governance. The Patriarch of the Redwood Throne is pushing him to make it a Prince-Bishopric. The Hulder is a major center of guild activity and shipping. It covers little land past the walls of the port city, but it has a great deal of influence beyond its size. The northeastern region of the Principalities is ruled by a Prince-Bishop. This lord wields his authority under the direct benefice of the Redwood Throne, and is one of the Church's highest-ranking members. This domain is an enclave within the Prince-Bishopric of Brezha. It is the seat of Imperial rule, and the largest city by population in the Principalities (and Gaunt, Oresund, and Athral Isle, for that matter; only the capital city of the Caliphate can compare). Eisenmark suffers from the depredations of Gauntish incursions. Verdien warrior orders have mostly shifted their base of operations here. The Skattenmark - "Shadow March" - was annexed from Tarsikka two centuries ago. It remains an eerie place, more like Tarsikka than the rest of the Principalities. It chiefly produces timber.